I've got some spiffy nail art tonight, using two colors from the China Glaze On Safari collection. I used two colors I was really excited about when press releases first popped up on blogs last year, Desert Sun and Exotic Encounters. They definitely belong in the same collection, so I thought they probably belonged in the same nail art piece. 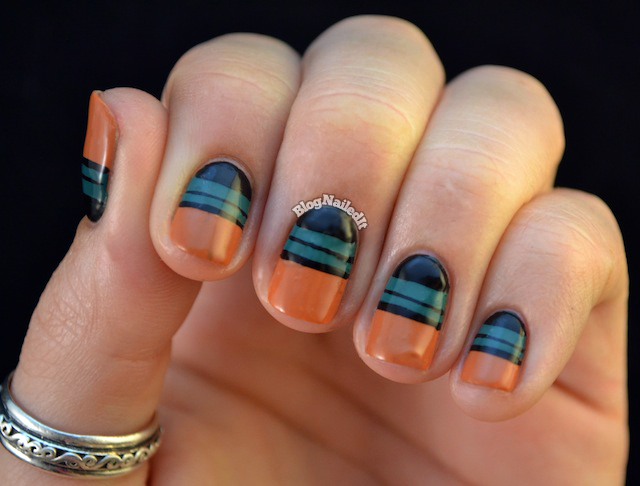 The uneven stripes were drawn freehand with Black (Color Madric). Unfortunately, my top coat is getting a little thick so I dented a few spots as I was setting up my camera and lights. Lesson learned there: get everything out that you will need beforehand! I hadn't even thought that I'd need to do camera set ups first, but it makes sense. These colors work so well together, one of the reasons this is such an excellent fall collection! I love how you put the design up at the cuticle area instead of at the tips, very pretty.